Broadcaster takes on new rapid-production Google Maps mash-up builder, giving users new narrative trail. 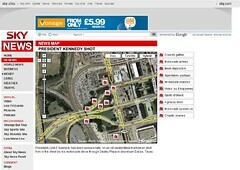 Sky News is to roll out new software designed to enhance online news stories with map-based navigation. The broadcaster will take on technology, SkyMapping, that produces Google Maps that tell stories using geographical data. The first results will be seen during next week's Crime Uncovered series, during which a map will display viewers' videos uploaded to the YouTube-like SkyCast media portal. SkyMapping was developed by Puffbox, a small, Newbury-based consultancy run by former Sky News web worker Simon Dickson. "The idea came to me in the wake of the Virginia Tech shootings," Dickson wrote. "It was a major news story confined within a very small geographic area, with lots of eyewitness accounts, some accompanied by photos and even video. But you didn’t really get a sense of how it all pieced together. "I knew there were ways we could use the Google Maps API to identify a particular aerial view, mark points on it and add rich HTML content into the pop-up ’speech bubbles’. With a bit of extra coding, you could create a notional ’sequence’ of points, with each one linking to the next, letting you tell a proper flowing narrative." Whilst maps are frequently used as storytelling devices in television and newspaper stories, the extra navigational features of online equivalents - and, in particular, the possibilities opened up by the Google Maps platform - allows online reporters to do far more immersive work. Sky News previously used a map to plot key locations, along with video, in the case of the Suffolk prostitute murders, but news staff more used to writing than hacking bits of code need to be able to roll out such features quickly. Dickson said he had made it "a doddle for a non-geek journalist to throw a flowing narrative mash-up together in a matter of minutes".